‌ A special thanks to the guys at Laravel Daily for asking us the question! And here comes our answer. It's an ocean of CMSs and website builders and their number is growing by the day. We've said that before in our blog and we'll say it again. 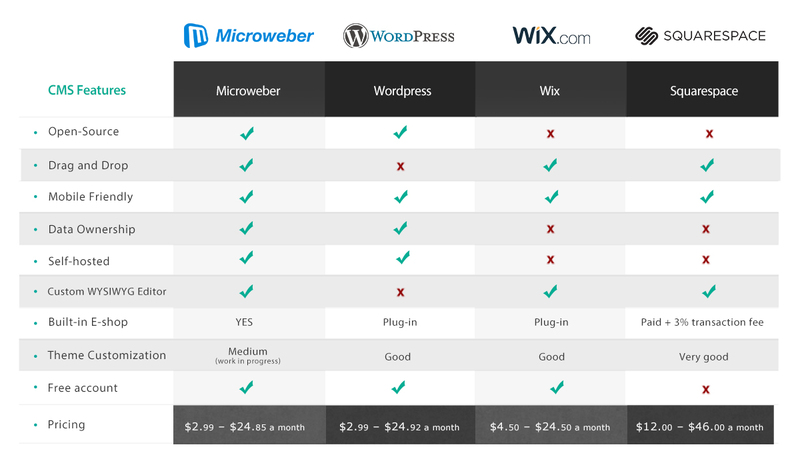 So why choose Microweber instead of Wix, Squarespace, Wordpress or any other one of the popular web building platforms? Well, it's obvious for us, the guys who made it, but a recent tweet by our friends at Laravel Daily did a great job to make us realize we need to tell you a bit more about why we are different and better. Microweber was born out of frustration, literally – we were sick and tired of stumbling upon the same difficulties and problems using the popular web builders some of the features were making us go mad; the lack of others even more so. We were slowly but surely growing confident we could do better than that – in more than one way. And we had the energy, enthusiasm and determination to do it. So, we sat down and did it – by the way, we are still doing it every day and this is our fulltime job. Nobody is perfect, and neither are we – there are tons of jobs to be done, but we are coping with the help of the amazing online community we've been able to build around ourselves. So, what are the main differences between Microweber, Wordpress, Wix and Squarespace? One of the strongest advantages of Microweber is that it is open-source, meaning anyone is free to play around with the code, make improvements, bug, debug, edit and contribute. The open source community is a great source of feedback, flexibility, security and stability – that's how we see it. We are what we are because of them. It's the open source community that made Microweber even better, by asking us to switch is based on the latest framework – Laravel. So, now we are better than Wordpress, who use older programming paradigms. Why Drag and Drop is better? Because it's easier – and because it's more fun. Drag and Drop lets you see the result of your actions instantly on your screen. No code knowledge required, you can modify your website template as you wish. You got it! Live edit is a specific and unique feature of Microweber, combining Drag & Drop and a custom WYSIWYG editor. You may ask why we took the effort to write our own WYSIWYG editor, when we could have used a third-party product (like Wordpress)? The answer is simple – we did not want to depend on third-party updates, support and problems. Our custom WYSIWYG editor gives us the freedom and ease to create a smooth experience for ourselves, and for our users. One of the main advantages and key features of Microweber comes in the form of its online store functionality, which is built in in every single template. And it's free – really free, we don't charge anything extra. We don't charge you for the module, and we don't charge you for the sales you make from your store built on our platform (Like Squarespace and Shopify). Self-hosting means you can host your website with any provider around the globe – Microweber lets you do that. Self-hosted websites provide the ultimate in flexibility and customization. There are fewer restrictions in terms of the changes you can make to layout and design, and you can add any functionality you choose. If you’re unhappy with your hosting company, you can always switch to a different provider. Microweber lets you own your own data – this means you have legal rights and complete control over your set of information. Every single element of data is assigned to its owner. This is one of the areas where Microweber still has a lot to do and lacks behind the others in the game. We are working hard every day and will get there soon, but for the time being, we are only average compared to Wordpress, Wix or Squarespace in terms of theme customization. But do stick around – great stuff is coming soon! We already mentioned Microweber allows you to actually build a website with zero costs. Many of our 40,000+ active users are evidence for that. Unlike Squarespace, where FREE is not an option. In the case of Wordpress, various statistics suggest a complete basic website (with or without an online store) will eventually cost you at least $200 with the bill possibly soaring up to $1000. It's not like you can't buy stuff on Microweber – you sure can buy fancier templates, hosting plans, support, etc. But our core mission to give the power of online expression in the hands of the average user, will never change. So, what are you waiting for – go to Microweber and make web!